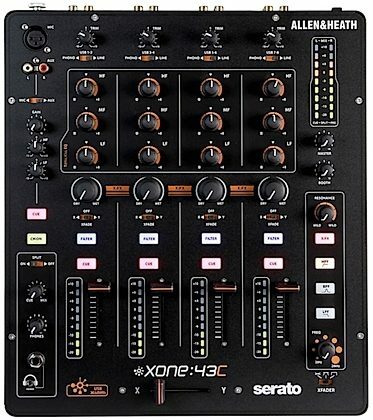 The Allen and Heath Xone:43C is the perfect gateway to the full spectrum of digital DJing. The mixer is supported by leading DJ Software, Serato DJ, and is DVS upgrade ready with the addition of the Serato DJ Club Kit - eliminating the need for any external interface. Whatever your workflow, Xone:43C delivers a uniquely fluid mixing experience. 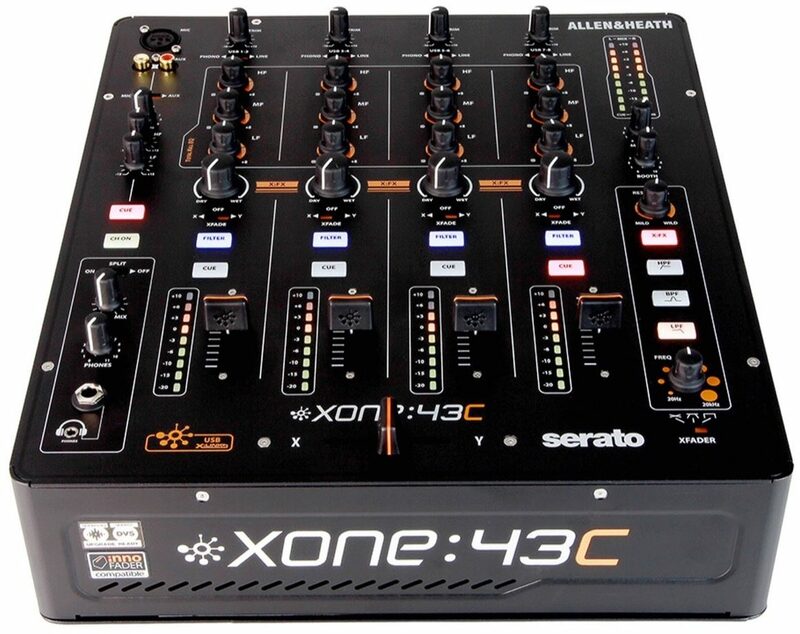 Xone:43C is a 4+1 channel mixer, offering a simple and intuitive layout with sublime analogue audio quality. The mixer is equipped with the legendary Xone filter, 3 band EQ, plus X:FX, giving a single control per channel over the send/return to work with external FX units. For even more hands-on creativity, the X:FX can also be routed to the Xone filter to add layers of FX and filtering. 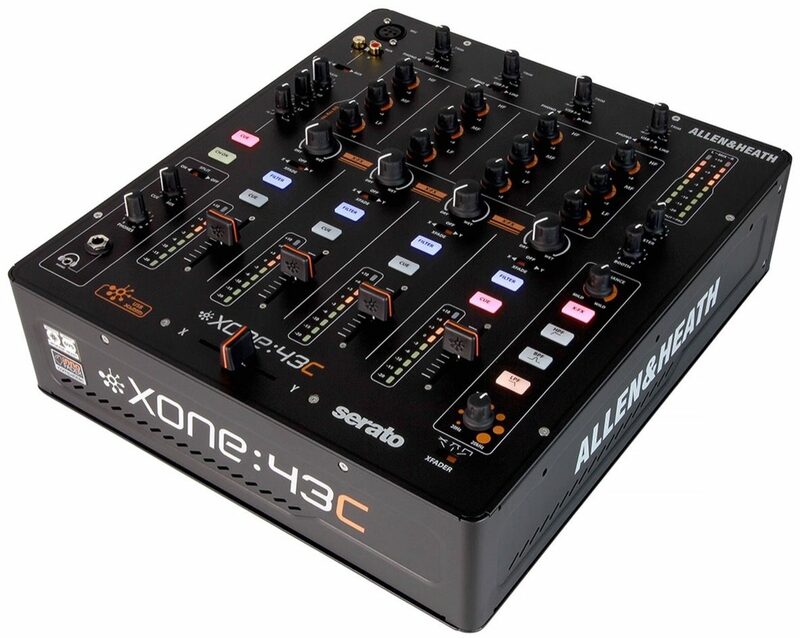 Xone:43C also incorporates a premium quality internal 16 Channel USB Soundcard for integration into digital DJ workflows, plus plug n' play connection via X:LINK to Xone:K series controllers for expanded MIDI control. The crossfader has three switchable curve settings for blending or scratching styles and can be easily replaced or upgraded to a custom Innofader for ultimate crossfader performance. With balanced XLR main outputs, independent booth and record outputs, Xone:43C has the quality and versatility to become the centrepiece of the club booth or audiophile personal DJ setup. Xone:43C is an affordable, elegant solution for using Serato NoiseMap Control Vinyl or CDs for hands-on control over Serato DJ software. Simply purchase the Serato DJ Club Kit which is available in-app within Serato DJ or via the Serato Online Store. 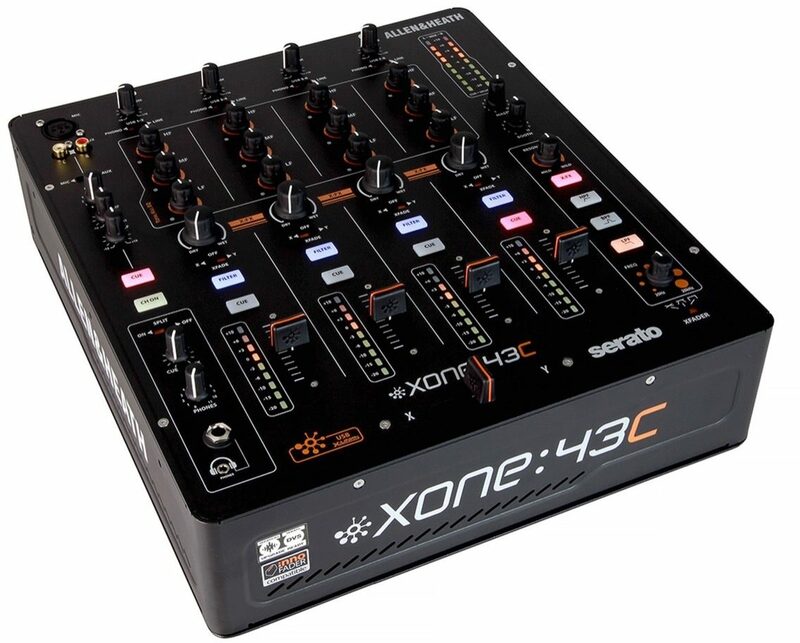 Xone:43C offers a convenient, plug 'n play route into DVS DJing, eliminating the expense and clutter of using an external interface. (Mixer does not support full control of Serato Video). 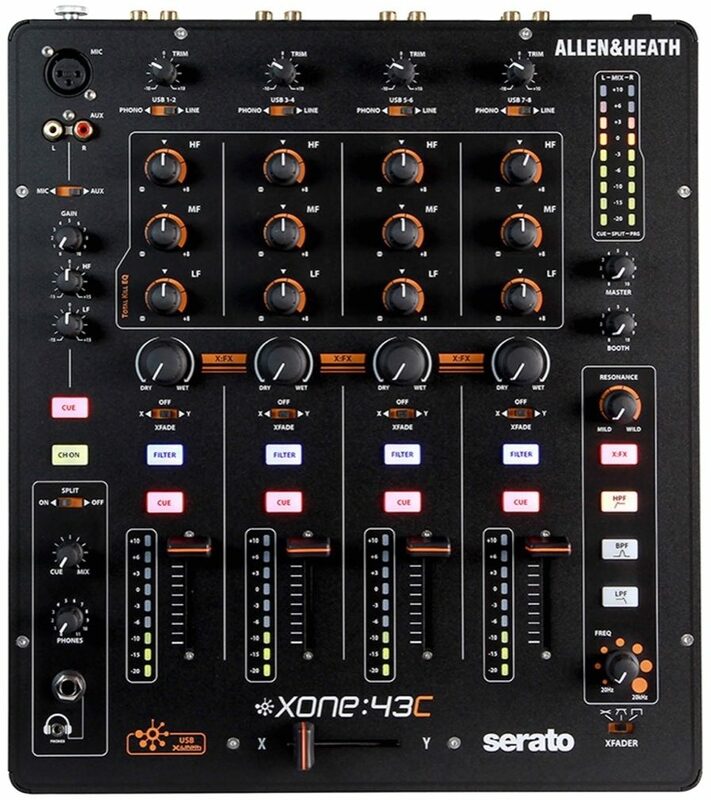 Xone:43C incorporates a high specification 16 Channel 96kHz, 24bit USB Soundcard, allowing it to be seamlessly integrated into digital DJ workflows. The original and best. The Xone filter is a legend in the DJ booth - none of its imitators come close. Xone:43C's filter includes HPF, BPF, LPF, resonance control and frequency sweep, plus the option to route the X:FX to the filter. An intuitive and simple way to work with external FX - X:FX provides a single control per channel over the send/return to work with external FX units. For even more hands-on creativity, the X:FX can also be routed to the Xone filter to add layers of FX and filtering.. For even more hands-on creativity, the X:FX can also be routed to the Xone filter to add layers of FX and filtering. For the ultimate digital DJ setup, connect Xone:K series controllers to the Xone:43C over X:Link for hands-on control over your software. When used with Serato DJ, the Xone:K1 is pre-mapped to control cues, loops and Serato DJ FX for control decks 1 through 4. On top of its four fully featured phono/USB/line channels, Xone:43C has a flexible mic / aux input with XLR and phono connectors. If you don't perform with mics, the phono inputs allow this channel to be used as an extra stereo music source. Fully fledged local monitor (booth) output and separate Record output to capture the mix is a rarity at this price point, making Xone:43C perfect for the DJ who requires a compact mix tool.